A tough decision to make in Fantasy in the all-rounders' section. 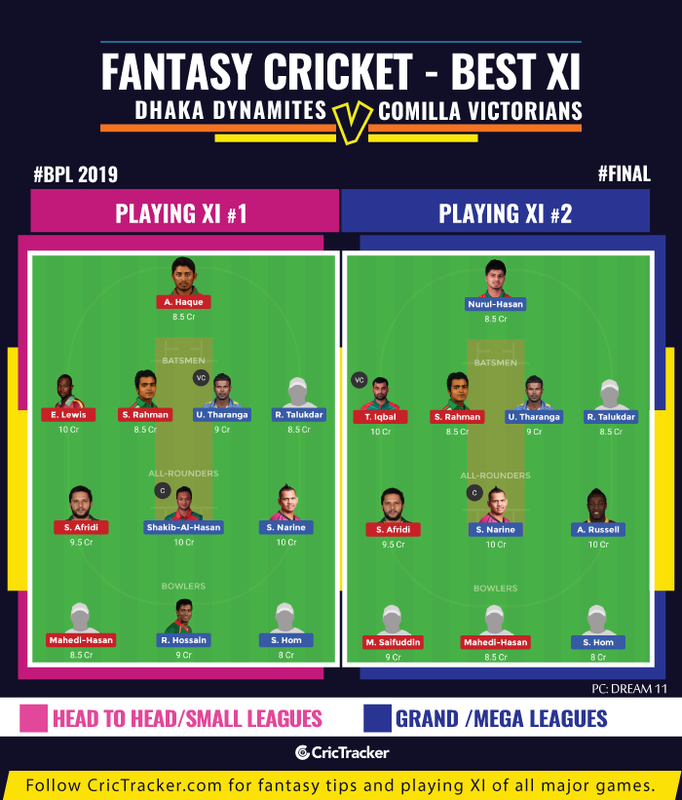 After 45 games of cricket in the sixth edition of the Bangladesh Premier League (BPL), it all boils down to the final that will be played between Comilla Victorians and the Dhaka Dynamites. The Victorians entered into the final first by winning the Qualifier-1 against the Rangpur Riders. However, the Dhaka franchise had to take the longer route to reach this stage. The team won the Eliminator against the Chittagong Vikings. They followed this up with another win against the Riders in the Qualifier-2 to enter into the last game of the tournament. With three consecutive wins under their belt and the support of the home crowd, the Dynamites will enter into the final as a confident unit. There isn’t much that separates both these teams and it should be an interesting game. The Final of the Bangladesh Premier League (BPL) 2019 will be played between Dhaka Dynamites and Comilla Victorians at Sher-e-Bangla National Stadium in Mirpur, Dhaka. The match starts at 7:00 PM local time (1:00 PM GMT) (6:30 PM IST). Chasing is preferred at the Shere Bangla National Stadium in Dhaka. The venue has witnessed mediocre scores in the last few games. The predicted increasing level of humidity as the match progresses might quicken up the pitch in the second innings. Upul Tharanga, Sunil Narine, Rony Talukdar, Shakib Al Hasan (C), Nurul Hasan (WK), Andre Russell, Kieron Pollard, Shuvagata Hom, Qazi Onik, Mohammad Naim/Mahmudul Hasan, Rubel Hossain. Bench – Heino Kuhn, Hazratullah Zazai, Darwish Rasooli, Andrew Birch, Mohor Sheikh, Mizanur Rahman, Shahadat Hossain, Ian Bell, Aliss Islam, Rovman Powell, Asif Hasan. Tamim Iqbal, Evin Lewis, Anamul Haque (wk), Imrul Kayes (C), Shamsur Rahman, Shahid Afridi, Thisara Perera, Wahab Riaz, Mohammad Saifuddin, Sanjit Saha, Mahedi Hasan. Bench – Abu Hider Rony, Aamer Yamin, Ziaur Rahman, Liam Dawson, Mosharraf Hossain, Mohammad Shahid. Dhaka Dynamites left-arm pacer Qazi Onik played four matches in the 2019 edition of BPL. He picked up four wickets in these games and registered figures of 3-0-21-2 in the 2nd qualifier against Rangpur. He could be a good addition to your fantasy team. The prediction is that the team batting second will win the match.